shouldn't turn to the federal govern- ment to bail you out." As crisis management continued to improve, the Joint RIETF/Corps & Coast Guard Committee met again in St. Louis on September 1 and made the decision to remove mandatory navigational and opera- tional restrictions on industry. Less than one month later, AWO re- ceived a letter from Assistant Secre- tary of the Army Robert W. Page noting that " ... without the intense, devoted cooperation of you and your people in bringing together a consol- idated effort, I am sure we would have reached a point that there would have been a national catas- trophe." Corps & Coast Guard Committee met to engage in long-range plan- ning to prepare for the spring navi- gation season. In that second indus- try summit, the industry decided to maintain the RIETF as a high-level emergency response policy group. Model 1600 Pollution Packer compactor/recycler is made to order for shipboard solid waste control problems, including plastic debris. With one on board, it's proof of your commitment against ocean pollution. St. Louis to prepare an operations plan and coordinate industry, Corps and Coast Guard preparedness. Overall, AWO members worked in an unprecedented cooperative ef- fort during the Drought of 1988. Much more important than how dif- ficult the last summer was, is the story of how successful the barge industry was in surmounting the op- erational and commercial obstacles brought about by the drought, and how successful the barge industry was in turning what could have been an operational and public relations disaster into a shining success. Jones Act strongly defend a statute which was enacted principally for national defense. 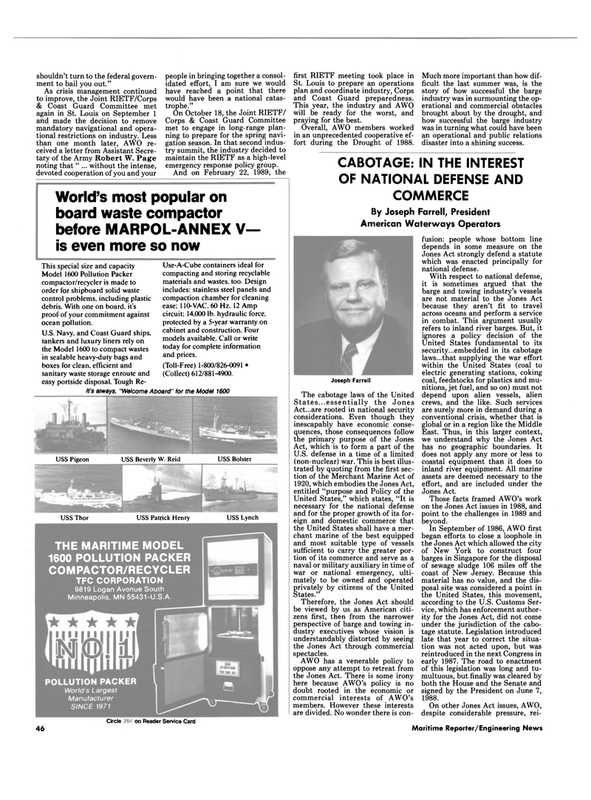 Those facts framed AWO's work on the Jones Act issues in 1988, and point to the challenges in 1989 and beyond. In September of 1986, AWO first began efforts to close a loophole in the Jones Act which allowed the city of New York to construct four barges in Singapore for the disposal of sewage sludge 106 miles off the coast of New Jersey. Because this material has no value, and the dis- posal site was considered a point in the United States, this movement, according to the U.S. Customs Ser- vice, which has enforcement author- ity for the Jones Act, did not come under the jurisdiction of the cabo- tage statute. Legislation introduced late that year to correct the situa- tion was not acted upon, but was reintroduced in the next Congress in early 1987. The road to enactment of this legislation was long and tu- multuous, but finally was cleared by both the House and the Senate and signed by the President on June 7, 1988. Therefore, the Jones Act should be viewed by us as American citi- zens first, then from the narrower perspective of barge and towing in- dustry executives whose vision is understandably distorted by seeing the Jones Act through commercial spectacles.